Already sadly half-forgotten, Roger Zelazny was one of the best science fiction/fantasy writers in the generation that came after the golden era greats like Asimov, Heinlein, Wyndham and Clarke. 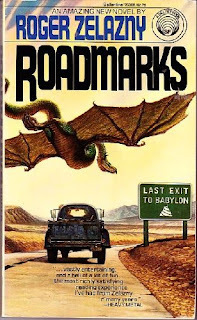 He often wrote in a science fiction - fantasy crossover known unimaginatively as science fantasy, which seems to have almost disappeared as a genre - and why it can be so good is demonstrated masterfully his short novel Roadmarks. It's science fantasy in that it operates like science fiction, with logical, science-based content providing the setting, but it contains a couple of off-the-wall elements that don't have any scientific basis. Arguably, the one area science fantasy has flourished is in superhero stories - but Zelazny's are far more interesting. 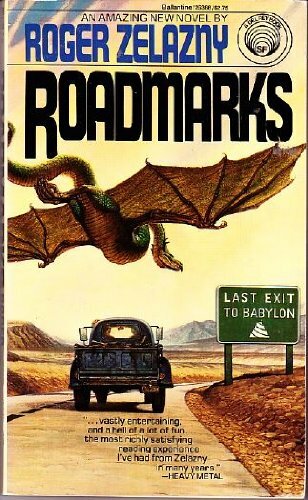 Although Zelazny is probably best remembered for his highly entertaining Amber fantasy series, Roadmarks is significantly more sophisticated in its approach. To begin with it's not totally clear what is going on - in a good way. You just have to go with the flow as you go from chapter 2 to chapter 1, then the next chapter 2. Objects and people seem to change without reason - but all will become clear in what is one of the best time travel stories I know. Interestingly, time travel really doesn't play much of an active part in the story, despite being the backbone of its setting. The way it is used is wonderfully casual - at one point, for example, we meet an ex-crusader making a living by washing car windscreens. The book's one flaw is something that dogs much of Zelazny's work (and may be why he wrote with co-authors so frequently) - he appears to have been rather a quick and dirty writer. It feels like he dashed off a book, then wanted to get onto the next project. I frequently complain that books are too long, but this one could have been a bit longer. The ending for example, though effective, seems rushed. The whole thing could have done with just a little more work. But that doesn't stop it being a gem of the genre. Rereading it for the first time in 20 or more years has inspired me to go out and hunt up some more vintage Zelazny - he was, without doubt, a master of the craft.